The heat is on for installers to brush up on their training says HETAS which is calling on all registered installers who completed a HETAS H003 Dry Appliance course prior to June 2014 to tune up on their skills with a refresher course. Since June 2014 it is a mandatory requirement from MHCLG (Ministry of Housing, Communities & Local Government – formally DCLG) for all registered operatives on combustion appliance competent person schemes to have successfully completed a relevant training course within the past 5 years. HETAS offers a range of comprehensive courses specifically designed for installers, retailers and those involved in the wood fuel and biomass chain. The refresher courses are available to any person who has previously completed a HETAS course. Three Day Solid Fuel Awareness including the Engineers course. 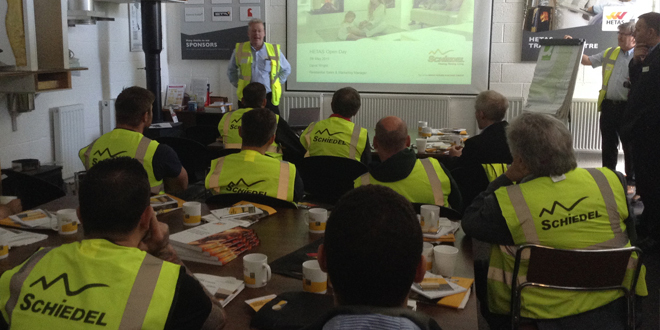 The industry-leading H003 Dry Appliance course is suitable for stove retailers, chimney sweeps and allied traders who wish to install, service and maintain dry solid fuel appliances. The course is a pre-requisite for installers keen to be a registered member of HETAS’ Competent Persons scheme. Prior to the exam, candidates on the refresher course could be eligible to receive relevant course documentation by registered post, before sitting a preliminary test at their local HETAS training centre. If successful, candidates can then proceed to the full Practical and Theory Assessment, as per the current H003 exams. Becoming a HETAS Registered Installer has several advantages, including access to the HETAS online shop offering a variety of tools and equipment with the option for dual HETAS branded items. Installers who are HETAS Registered also have access to a wealth of information, regular industry news, technical bulletins and regulation updates, as well as registration onto the Competent Persons Scheme. One of the many benefits offered to HETAS registrants is access to the technical helpline. Used as a means for discussing safety and technical areas with installers, the helpline is a great resource for those seeking advice and knowledge from experienced professionals. It offers additional expertise provided by HETAS’ partners including the BFCMA, Stove Industry Alliance, Solid Fuel Association and chimney sweep associations as well as from all the manufacturers who have HETAS Approved appliances. If you are aware that your refresher training is due soon, please contact your nearest HETAS Approved Training Centre, available in England, Wales, Scotland, Northern Ireland and the Republic of Ireland. To find a full list of HETAS Approved Training Centres visit www.hetas.co.uk/professionals/training-centres.